Yesterday, Aneesa Khan was going to speak on behalf of the youth constituency at the opening of the Subsidiary Body for Scientific and Technological Advice (SBSTA). The youth is given only two minutes to speak at the opening and closing of negotiations. This time, however, the chair did not even leave enough time for the intervention to be read. 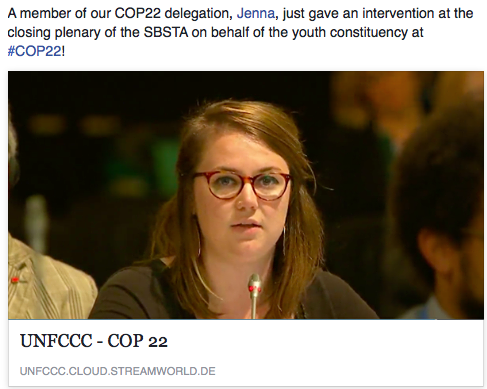 We are posting it here as we consider the messages key and valuable for COP20. My name is Aneesa and I speak on behalf of those who will live long enough to experience your legacy. Climate change isn’t my future, it is affecting me now. Weak vows, broken promises, low levels of ambition and high levels of passivity have led to the deplorable state of efforts to control climate change today. It is time for things to be done differently. We, the youth, believe its possible. For a real change, we need to shift our focus away from false solutions like Carbon Markets. Carbon Markets shift responsibility and burden away from developed nations through the offsetting mechanism which is riddled with fraud and human rights abuses. It is uncertain whether markets will actually deliver what they promise. Will the UNFCCC be a place for real solutions or for making profits? Parties are pushing once more for flexibility using a centralized carbon trading platform under FVA and NMM to avoid their historical responsibilities. In One year, SBSTA and all parties should agree on a moratorium on failed carbon trading mechanisms and take up real non-market solutions, such as the globally funded feed in tariff scheme and carbon taxes. REDD+ lacks effective monitoring and safeguards. Emissions accountability is converted into offsetting and buyouts as opposed to reductions and change. This is yet another false solution. Interests of nations and transnational corporations are financially involved and invested in land use that demolishes the livelihoods of forest, land-based and indigenous communities. Acknowledgement of these peoples and proposals for climate smart approaches are insufficient and not enough. It is mandatory that the voices and lives of those working on the ground are at the forefront of a just and equitable approach to land use. Knowledge and technology will play a key part in future solutions so it is important to ensure we do it right. We need a platform or mechanism for sharing technology and knowledge. It must allow multidirectional sharing but also ensure contributions based on Equity and Common But Differentiated Responsibilities. Countries and communities need to have access to information and technology in order to find effective solutions for adaptation and mitigation, and existing barriers such as Intellectual Property Rights need to be replaced or refined to ensure this happens. We demand a fair and just agreement as well as bold and immediate action to halt climate change. We will remain vigilant, and we will not hesitate to raise our voice if you do anything different. We have said what we have to say, it is time for you to do what you must do.